Saturn’s moons are a treasurehouse of beauty and strangeness. I’ll highlight a few for this Advent calendar, beginning with one we still don’t know much about: Methone. This moon is egg-shaped and tiny: only about 3 kilometers (1.9 miles) across its longest side. Its shape probably means it tumbled rapidly during formation, like the dwarf planet Haumea. However, the weirdest thing about Methone is how smooth its surface is: objects with solid surfaces in our Solar System tend to be crater-scarred. Even Earth has a number of craters, though many old ones have been eroded away by weather and other phenomena; atmosphere-free bodies like the Moon and Mercury are pock-marked. 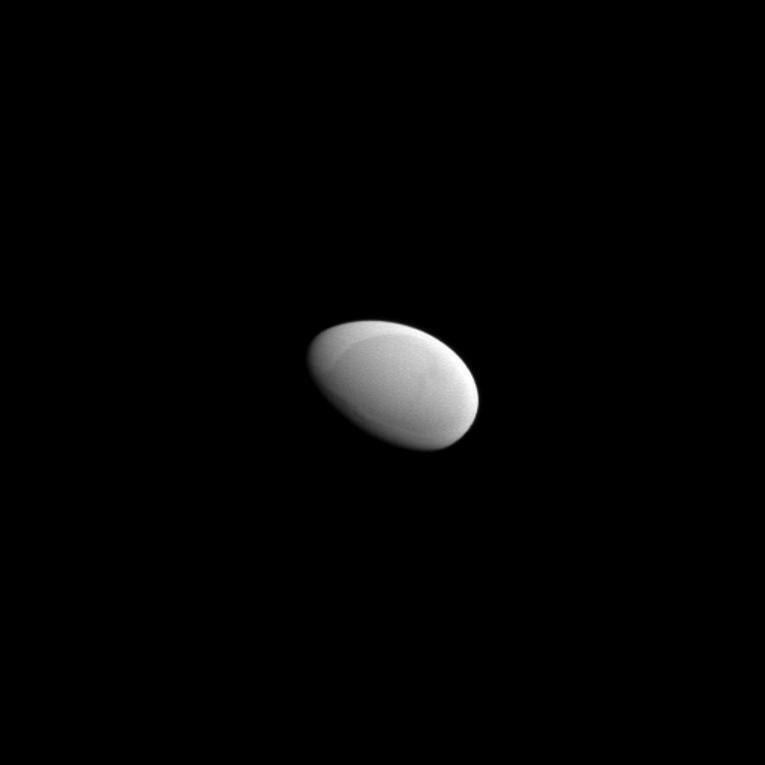 But Methone is smooth, meaning there probably is some way the moon has of renewing its surface. The image above was taken by the Cassini spacecraft, in orbit around Saturn. Further study of Methone is complicated, since the moon is hard to fly by, so getting higher-resolution images or clear analysis of the surface material will be challenging. However, the most likely possibility is that the moon is covered with a fine material: grains of ice and rock, which hide the craters that were created during the turbulent time in the Solar System’s early history. Nevertheless, how exactly all of this works remains for now a lovely mystery.